C. C. Wang (Suzhou 1907 – July 3, 2003 New York City) was also known as Wang Chi-ch'ien or Wang Jiqian. 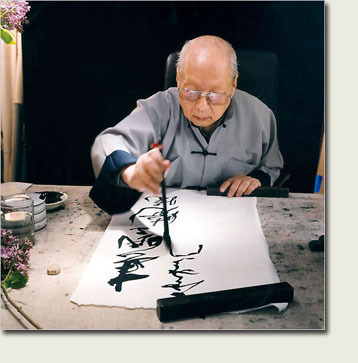 He was a Chinese painter, calligrapher, collector and connoisseur. After moving to New York he began to experiment with a synthesis of traditional Chinese style and modern Western techniques. Most famously he employed "accidental" textures to build up the ground of his landscapes. He called these paintings "mountains of the mind" or "mind landscapes" since they were intended to evoke both thought and emotions. Born in Wu County, Jiangsu Province, China. Studied under Suzhou painter Gu Linshi (1865-1933), Who is also a collector of classical Chinese painting. Studied painting with well-known painter and collector Wu Hufan (1894-1968) in Shanghai while simultaneously studying law in the evening Law School in the Soo Chow University. Served as member of the committee for the first major exhibition of Chinese art from Beijing Palace Museum collection in London, England. Co-authored "The seals of Chinese Painters and Collectors in Ming and Qing Dynasties" with German art historian Dr. Victoria contag. (Note: Revised edition with supplement was published later in 1966 by the Chinese University of Hong Kong) Taught chinese painting at the Shanghai and Suzhou Academies of Art. 1949 Moved to the United States. Began to study Western painting at the Art Students' League, New York, New York. Exhibited his first one-man show at the Warren E. Cox Gallery, New York, New York. Taught painting at the Chinese University of Hong Kong. Served as Chairman at the Art Department of Chinese University of Hong Kong, and also taught Chinese painting at the same unversity (1962-1964). Exhibited in "The New Chinese Landscape: Six Contemporary Chinese Artists", which circulated throughout the United States, under the auspices of the American Federation of Arts, New York, New York. Solo exhibition: M.H. de Young Memorial Museum, San Francisco, California. Appointed Lifetime Fellow of the Metropolitan Museum of Art, New York, New York. Published first book "Mountains of the Mind: The Landscape Paintings of Wang Chi-Ch'ien" (John Weatherhill, Inc., New York and Tokyo) with Professor James Cahill's introducation. Retrospective exhibition, Los Angeles County Museum, Los Angeles, California. Exhibited at "Chinese Painting at Mid-Century", sponsored by the Renaissance Society, University of Chicago. Solo exhibitions: China Institute of America, New York, New York; Honolulu Academy of Arts, Honolulu, Hawaii; Fresno College, Fresno, California; Indianapolis Museum of Art, Indianapolis, Indiana. In additional, throughout the late 70's and 80's, C.C. Wang also had exhibited widely at museum, art galleries, and universities thoughtout the country and East Asia, including: Yale University, University of California at Berkeley, Tulane University, University of North Carolina, Pennsylvania State University, Indianapolis University, Columbia University and the Chicago Institute of Art. Exhibited in "Paintings and Calligraphy by Wu Hufan and His Disciples of Meiying Studio", Shanghai, China. Solo exhibition: Hugh Moss Gallery, London, England. Solo exhibitions: Hong Kong Arts Centre, Sponsored By the Chinese University of Hong Kong, Hong Kong; National Museum of History, Taipei, Taiwan. Participated in the show "Masterpieces of two Chinese Artists" with the artist Wang Fangyu at the Taipei Fine Arts Museum, Taipei, Taiwan. Invited to be an advisor to the "Art Connoisseurship", a renown quarterly magazinepublished in Shanghai, China. Invited to be an Honorary Member of the Shanghai Academy of Art, Shanghai, China. Published C. C. Wang: Landscape Paintings (University of Washington Press, Seattle and London) with an introducation by Professor James Cahill. Exhibited in "The Mountain Retreat: Landscape in Modern Chines Painting", Aspen Art Museum, Aspen, Colorado and Emily Lowe Gallery, Hofstra University, Hempstead, New York. Served as Visiting Professor of Fine Arts, Shanghai Institute of Chinese Painting, Shanghai, China. Solo exhibition: Birmingham Museum of Art, Birmingham, Alabama. Retrospective exhibition, "Mind Landscape: The Paintings of C. C. Wang", organized by the Henry Art Gallery, University of Washington, Seattle, Washington. The Exhibition traveled to the Spencer Museum of Art, University of Kansas, Lawrence, Kansas; the Chinese Culture Center, San Francisco, California; the China Institute in America, New York, New York. Exhibited in "Six Twentieth Century Chinese Artists", from the collection of Murray Smith, at the Los Angeles Museum of Art, Los Angeles, California. Received the Governor's Asian American Heritage Month award from Governor Mario M. Cuomo, New York, New York. Exhibited at Liaoning Museum at Shenyang, Liaoning Province, China. Solo exhibition: Sponsored by Lo Shan Tang, Hong Kong. Solo exhibition of Calligraphy: Gallery 456, New York, New York. Received the Certificate of Merit from New York City in recognition of outstanding achievement in the arts. Solo exhibitions: Taipei Fine Arts Museum, Taipei, Taiwan; National Tsing Hua University Art Center, Hsin-Chu, Taiwan; Pristine Harmony Art Center, Taipei, Taiwan. Solo exhibition of Landscapes and calligraphy with accompanying catalogue, "C.C. Wang: Landscape and calligraphic images", Plum Blossoms Gallery, Hong Kong and Singapore. Exhibition "The C.C. Wang Family Collection of Fantastic Rocks" E&J Frankel Ltd., New York, New York. Solo exhibition of painting and calligraphy "C.C. Wang: old Master, New Ideas" at E&J Frankel Ltd., New York, New York.